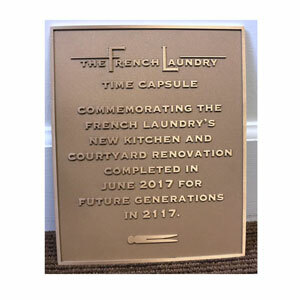 You always start out ordering a plaque by choosing the size. But how do you do that? Write out on a Word File or a piece of paper what you want your plaque to say. Count the number of characters: count all letters, numbers, and spaces. Divide that number by 3.5. This gives you a quick way to find the square inches you need at a minimum. You may want to make the plaque larger to allow for white space. 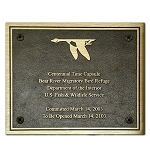 Find a plaque size that is close to the size in square inches. Determine whether you like it better in a Portrait (Vertical, e.g. 8x10) or Landscape (Horizontal, e.g. 10x8) layout style. You have counted your letters, numbers, and spaces and it is 187 characters. Divide 187 by 3.5. It is 53. This is the minimum amount of square inches in area for your estimate. 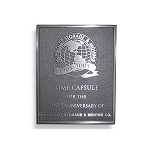 The closest size that fits 53 as minimum is 80, such as the 8x10" common plaque size (it can also be 10x8") and for this you can choose either the small aluminum plaque or the small bronze. To fit, you may need to go with all capital letters, or a condensed font, or revise the number of lines. But size and space in between letters is important. See exact listing below for other sizes. See art requirements if you need to do your own design. Be sure to let us know your font preferences and anything else you think is important. To find the existing area of any rectangular plaque, simply multiply the length by the width. 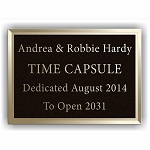 Available common plaque sizes follow, along with square inches already multiplied for you. We split them up by material (either aluminum or bronze) and by general size (small, medium, large, extra large). 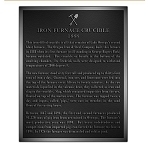 To get the minimum you need, the formula above will work for either horizontal (landscape) or vertical (portrait) orientation for most plaques that only have words. It is the minimum - so you may wish to go even larger. Logos. If you have a logo or special lettering, add space for that. Big borders. If you want a double border or single line bevel edge border, add more space. Separation lines. If you want to separate certain lines of the plaque, add space for that, too. 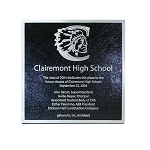 To get some ideas, look at some examples in our plaques gallery. Not only does it have ideas on spacing, but you can see how other people have worded their plaques and it will help you with yours. Now the message is much shorter. You are saying the same thing with less words. 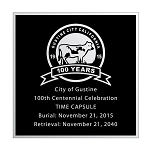 People know that a centennial is 100 years. Also, one will know that their bicentennial will be celebrated in 2116. No need to be too specific in the placement date, either, since anything can happen in the weeks before the event. If you have a specific date of founding, use it. Otherwise, be as general as you can. As for an opening date, I believe it is somewhat presumptive to choose an exact one. While you can look up what day of the week September 24 is in 2116, what if the group who must open the capsule cannot do it on that exact date? Do not presume. The message above is now 85 characters. 85 divided by 3.5 is 24.3, so this plaque can be as small as a 7x5 (35) or 8x6 (48) and not look too crowded. If you have a logo, drawing, or special lettering, you need to allow extra space. But just because it may fit nicely on a piece of paper or a web page does NOT mean it is okay for a plaque of the same size. The requirements for line thickness and spacing are critical. Line thickness should be no smaller than 1/16" or 3 points. Space in between lines or letters must be at least 1/16". If in ALL CAPITALS the minimum letter size is 1/4". If in Both Upper and Lower Case, the minimum for the lower case is .350" and for the upper .375" (3/8"). So, you can go smaller with capitals since that height minimum is smaller (1/4" or 2/8" is smaller than 3/8"). Logos should be simplified in most cases. Black and white, no grays, no shading - simplify. Registration marks, if mandatory, must be 1/4" sized with the R.
Convert any special fonts to curves or outline them. We have most basic fonts. If you wish us to choose a similar font to yours, send a sample for us to see in PDF format. Do not hesitate to call us or send us an email with your ideas. We are happy to help with sending more information and looking at the size for you. However, we cannot give you a proof until you order. Call 1.626.966.1955 or 1.626.804.1955 for assistance. 18x18, 20x20, 18x24, 20x24, and 24x24"